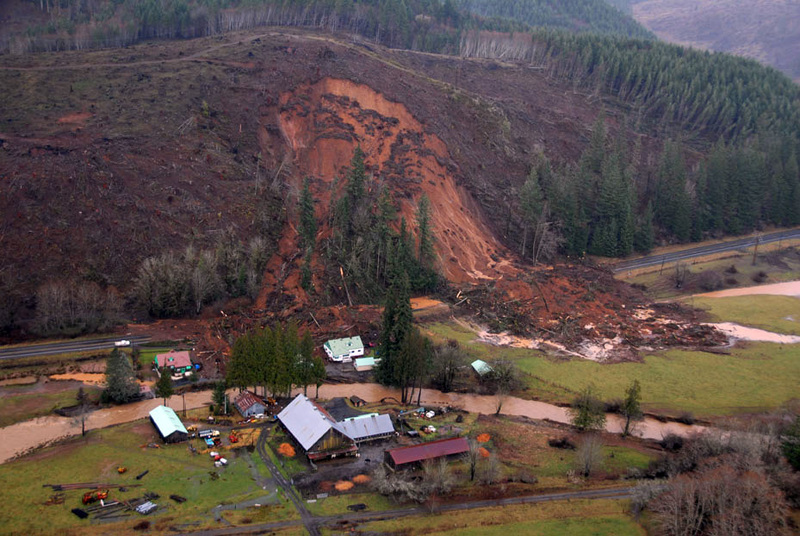 The Pe Ell Landslide failed during the December 3rd Storm of 2007, closing State Route 6 just west of Pe Ell. 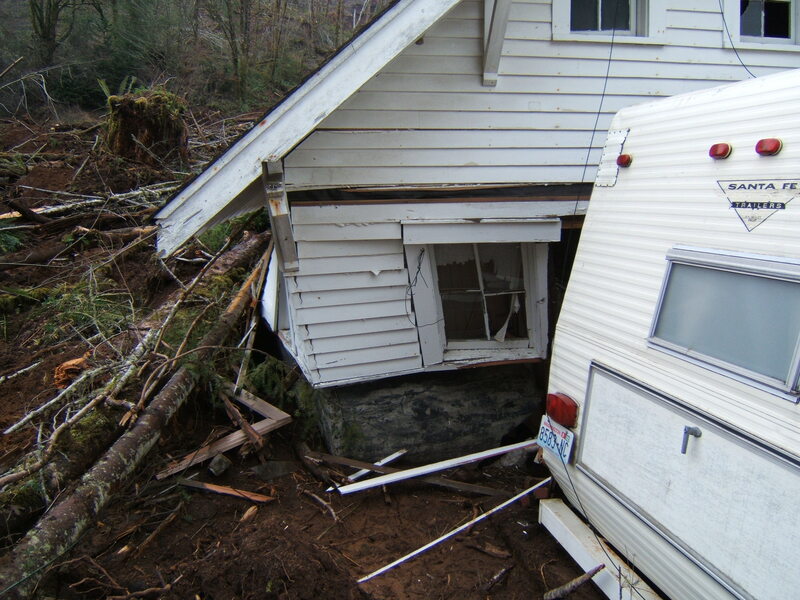 The debris avalanche/slide flowed across the highway and pushed a truck into the living room of the house across the way. Remarkably, most of this was caught on tape by the residences of the house. On December 11, Kelsay and I arrived at the landslide. The drive through the Chehalis valley was spooky to me, a lingering stench filled the air and misery could be seen all around. Home after home, farm after farm all showed damage from the floods. By time we arrived, WSDOT had already arranged for an emergency contract with Scarsella (on December 9th) to begin work on clearing State Route 6. Unfortunately, with all of the heavy equipment working on the site, we decided to stay on the periphery of the landslide and investigate the damage to the structures. 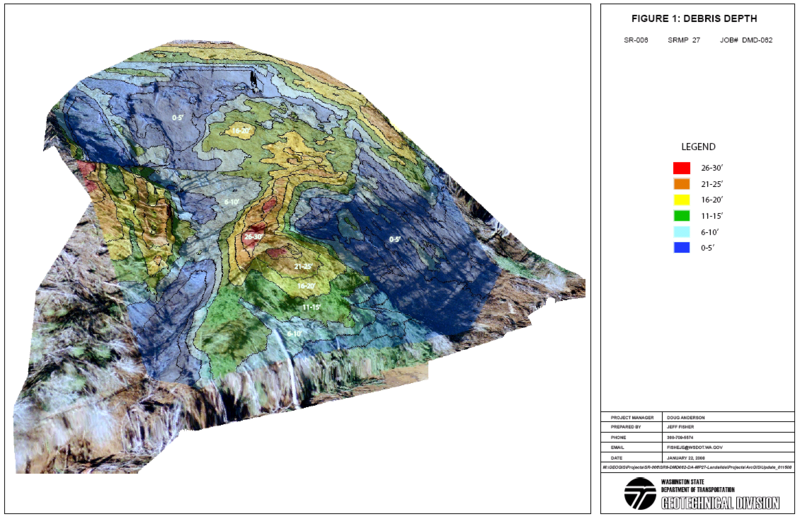 The damage was localized to the western lobe of the landslide. It impacted the houses at a low speed, warping and pushing them. 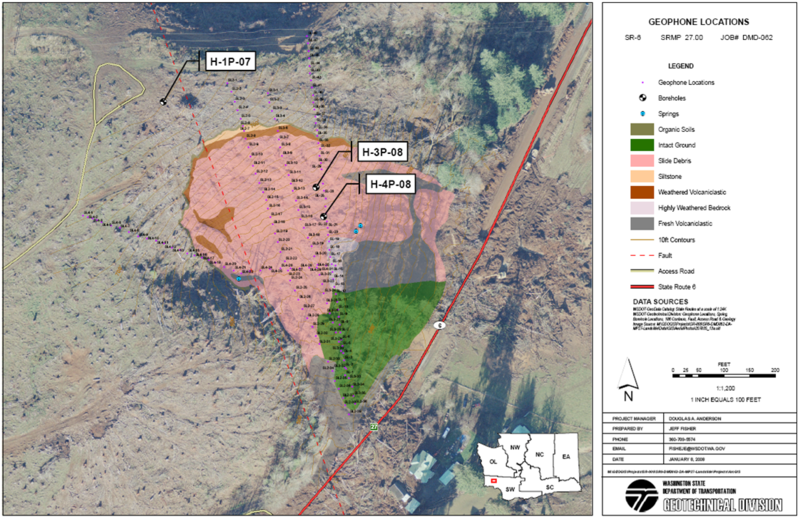 In the end, WSDOT removed over 47,000 cubic yards of material to stabilize the landslide mass at a cost of around $4 million dollars. The project was completed on March 13th, 2008, over three months after the storm. 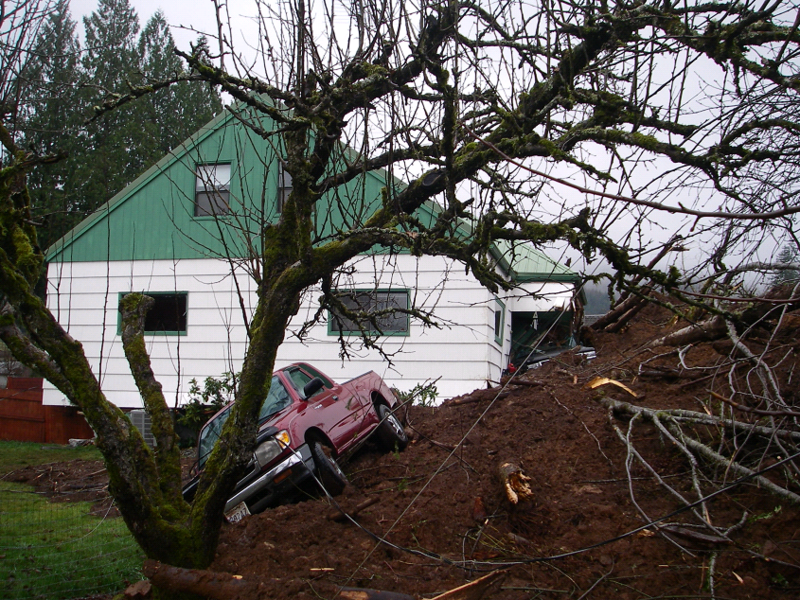 The landslide prompted a debate on logging, landslides, and highway safety. The landslide itself was logged weeks before the storm. The interesting part, this landslide wasn’t caused by root strength loss, it was probably too deep anyway to have much impact. The lack of canopy, however, might have played a roll in the landslide initiation. Canopy plays a role in reducing the rate rainfall from reaching the ground (to a certain point) or slow melting of snow on the ground by reducing rain rates and buffering changing temperature. It is difficult to say in an intense storm how much it might have slowed the rainfall, or reduced snow melt (by reducing the warm rain and temperature from reaching the snow), but the lack of trees, even with this intense rainfall, probably did increase the likelihood for its initiation. 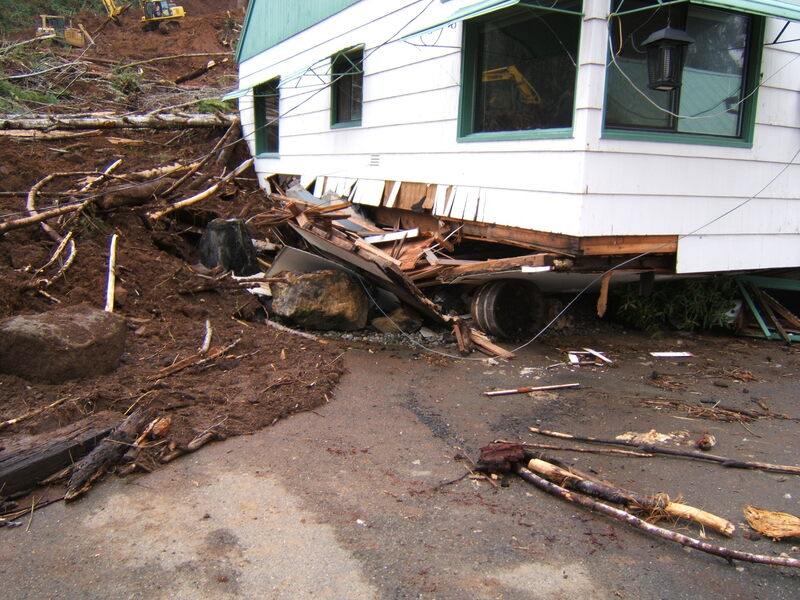 Cause aside, the cost of repairing these landslides is expensive. This is just one of probably hundreds of landslides to fall on our highway systems each year. Figuring out why these landslides fail and if we can either mitigate or possibly find better management practices to help reduce landslides would help save millions of dollars and reduce injury and death.